Destiny: Xur weapons, gear, and location, Oct 28 - 30. Bad Juju! But what’s any good? Bad Juju, basically. Okay, that’s not entirely fair. The Hunter Helmet is pretty strong - adding an extra shot to Golden Gun, which means a 30% damage increase on your super - but the other two? Niche in their purpose. Very niche indeed. The Titan’s Eternal Warrior looks cool in an ‘armoured silver face, holy crap the Autons and the Cybermen mated’ kind of way, but it really only furnishes the Unstoppable perk for free, meaning that the Fist of Havoc super will have damage protection throughout, not just during start-up. But how often does anyone kill a Havoc-leaping Titan? That said, it could be a boon in really hectic PvE encounters, making the Titan a tad safer when clearing out large crowds. The Warlocks’ Skull of Dire Ahamkara similarly reduces damage while firing off a Nova Bomb, and increases the effectiveness of Energy Drain, but really, it’s fairly redundant. If you’re looking at a Void Walker-specific exotic – particularly one for augmenting your Nova Bomb - then you really want to be looking at The Obsidian Mind, and as for Energy Drain, with the right build (ie. combine Embrace the Void with The Hunger, and possibly Soul Rip as well) you can create a pretty damn powerful ability-charging feedback loop without even needing to use an exotic. But Bad Juju? Hell of a gun. It fires fast, it’s accurate, it automatically reloads on every kill, adds extra charge to your super, and stacks up damage buffs in exchange for the kills you feed it. Just like a big, happy, eager-to-please dog. Made of skulls and murder. 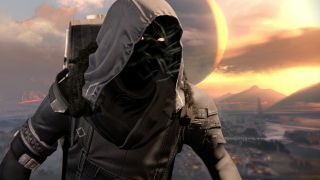 As ever, Xur will be around until 10am UK / 3am PT on Sunday, at which point he’ll swan off to do whatever for the next week. No-one knows what he does. No-one asks. One person once did but, well, no-one has since. Let that tell you all you need to know.